Iximche is a small Mayan archaeological site that can be found in the western highlands of Guatemala, about two hours away from Guatemala City. This is a tiny and not very popular place that hides a lot of importance for the history of modern Central America and especially for Guatemala. That’s why in the 1960s it was declared a national monument. Between the late 1400s and early 1500s, for about 60 years this was the capital of a group of Mayans called Kaqchikel, for years they were good friends of another Maya tribe called K’iche’. But when they started to have problems, they had to flee to a more secure region. They chose a ridge surrounded by deep ravines, this provided them safety, and that’s how Iximche was founded. The Kaqchikel and the K’iche’ kept having battles for years but the location helped protect the Kaqchikel. It was when the conquerors reached Mexico that Iximche and its people started to have serious problems. At first, they sent friendly messages to each other. Then Conquistador Pedro de Alvarado arrived in 1524 and together they conquered other nearby Mayan cities. For that reason it was declared the first capital of the Kingdom of Guatemala, making it also the first capital of Central America. The problems came when the Spaniards started doing excessive and abusive demands of their Kaqchikel hosts, and they weren’t going to take it for long! So what did they do? They left the city, which was burned to the ground two years after. Another town was founded by the Spaniards, really close to the ruins of Iximche, but hostilities from both parts continued until 1530 when the Kaqchikel finally surrendered. Conquerors kept moving along the region and eventually founded a new capital without the help of the Maya people. It is now called Ciudad Vieja (old city), located only 10 minutes away from Antigua Guatemala. 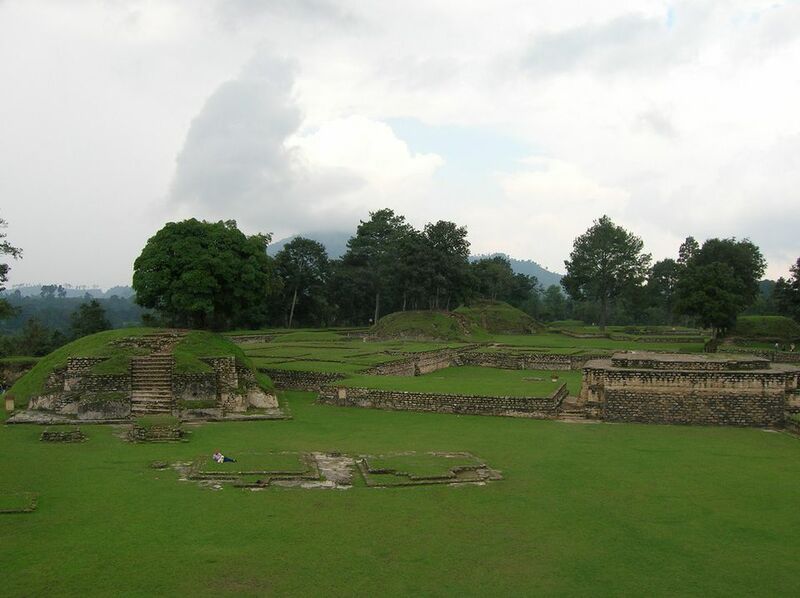 Ixhimche was rediscovered in the 17th century by an explorer, but formal excavations and studies about the abandoned Mayan City didn’t start until the 1940s. The place also served as a hiding place for the guerrillas during mid 1900s, but it is now a peaceful archaeological site that offers a small museum, a few stone structures where you can still see the marks that the fire left and altar for sacred Mayan ceremonies that is still used by the descendants of the Kaqchikel. When Spaniards took the city they changed its name and called it Quauhtemallan which evolved into Guatemala and eventually became the name of the country. It means forested lands. Tourist facilities at the site include visitor parking, a small museum with stuff found during excavations, a picnic area, and a football field. The remaining structures are palaces, ball courts, a ceremonial area, and temples. United States President Bush visited the site on March 12, 2007. The majority of visitors to Iximche are indigenous Maya. If you are lucky you can witness Mayan rituals taking place. However, if you want to watch you have to be very quiet and photos or video are not allowed. If you get there early in the morning or right before they close, be sure to bring a sweater since it can get chilly. Because it is a small place it won’t take you too much time to see it completely, so don’t leave a whole day to visit it. However, it does make a fun morning trip.